Pinterest Picks: DIY Clay Projects, Jingle Bell Embellishments + More — Gift Horse + Co.
A selection of gift wrapping ideas and inspiration, as discovered on Pinterest. 1. Glitter gift tags with gold bells and a bit of greenery. By Lindsay Stephenson on the Little House Blog. A wonderful elegantly simple combo. The glitter tape, gold bells (love!) and hang tags are all from Lindsay's shop, The Penny Paper Co., where she offers a really nice selection of refined gift wrapping supplies, including tags, ribbon and more. 2. Jumbo star label. From Blank. Add a single extra-large star sticker to a plainly-wrapped gift and voila! The stickers (approx. 2 1/2") are available in five colours in packages of 10 from Blank. 3. DIY clay gift tags. By Tristan B. on Besotted. There are tons of variations of DIY clay tags floating around the internet; these are some of my favourites. Tristan used her custom Besotted Brand stamps to emboss the air-dry clay. 4. Jingle bell wreath topper. By Shauna Oberg on Satori Design for Living. A DIY ornament that makes for the perfect Christmas gift topper with a lovely sound. + Double-banded favour boxes. On the Smitten on Paper blog. 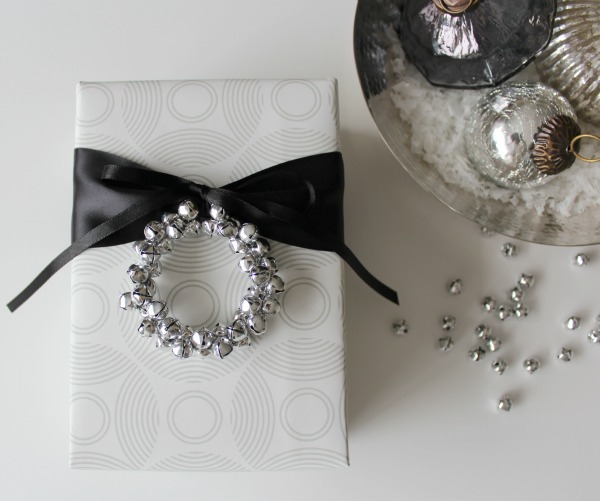 Two strips of paper turn a plain favour box into a chic gift. + Clay bunting gift topper. By Maria on Scandi Home. Another way to use air-dry clay: make your own tiny shapes, then paint them for a graphic embellishment. + Photos courtesy their respective owners.